The school marshal program allows certain school staffers to carry a firearm and neutralize active shooters on campus. Here's how participants train. 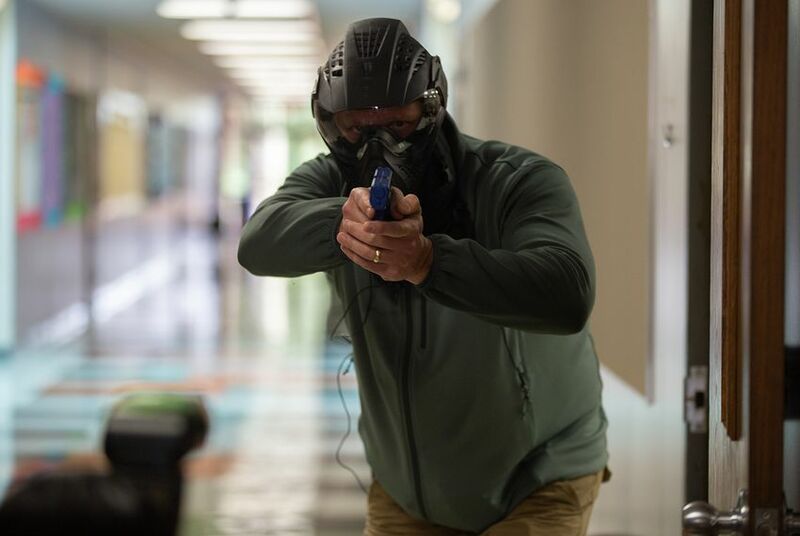 The Texas Commission on Law Enforcement was hosting one of its trainings last week for school marshals — designated school teachers, administrators and maintenance staff who are licensed to carry firearms in case of an active shooter on campus. The marshal program, which began in 2014, has grown considerably since the May shooting at Santa Fe High School south of Houston. Before this summer, TCOLE had hosted nine school marshal trainings in four years, said Gretchen Grigsby, the commission's director of government relations. But by the end of this summer, the commission will have hosted six more. Friday's demonstration came toward the end of an eight-day training session that educators must undergo to become school marshals. Trainees receive classroom instruction, live firearm training at a shooting range and training in simulated shootings such as the demonstration in Pflugerville. The simulation featured "simunition" — paintball-esque bullets shot from blue Glock 17s. Marshals range from janitors to school board members, and many of them didn't have experience in law enforcement, though they all must have a license to carry before they can enroll in the course. Kim Vickers, executive director of TCOLE, said the fast pace and panicked frenzy reflects a real school shooting, where as many as nine people can die every second a shooter is active. One of the hardest decisions in the moment is knowing when to shoot, especially when the mass shooter is a student, he said. "They've got to cross that idea of, 'Can I pull that trigger if I need to pull that trigger?'" Vickers said "And you really never know that — you really won't until the situation happens — but you'll come closer to resolving that in your mind when you're put in that situation where you're very keyed up and the adrenaline's pumping." And if you're wondering, yes, the fake bullets hurt. "If you're about to be shot with one of these, it really puts some pressure on you because one of these things, it stings pretty well," Vickers said. The school marshal program remains controversial. Many educators and activists argue that arming school staff increases access to guns for troubled students. But many Republican lawmakers have rallied around the program since the shooting in Santa Fe. Abbott included it in a series of recommendations to address school violence. In June, a special state Senate committee discussed ways to expand its funding. None of the committee's members spoke against arming teachers at the time. Vickers, who also testified at the hearing, said a threat can always fall through the cracks and manifest in school violence. It's always better to be prepared just in case, he said, and school districts are increasingly requesting marshal training for designated staffers. Trainees must also go through regular psychological screenings and retrain every two years. When marshals are teaching in a classroom, they have to keep their gun in a lockbox. Reporters were invited to Friday's training under the condition that they not identify any of the trainees. TCOLE says it doesn't publicize which school districts have marshals because it doesn't want to advertise the "soft targets" — schools that don't. 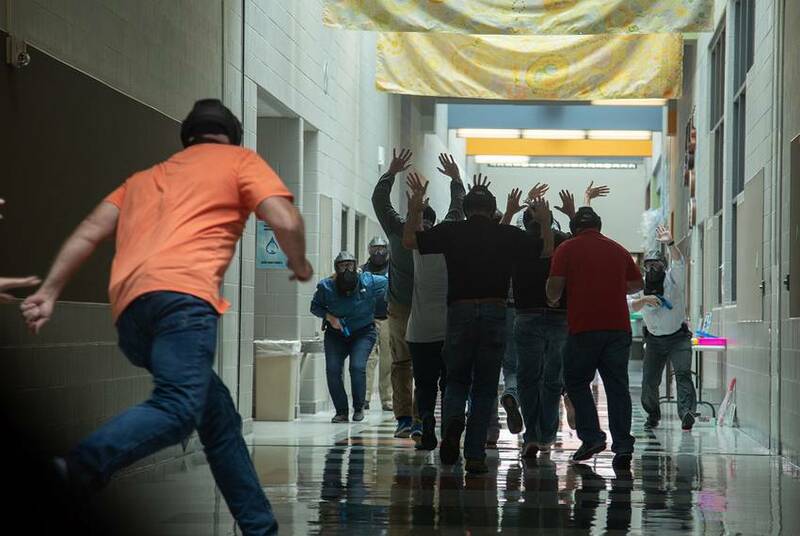 One of the trainees, who would not identify himself other than as "an educator from Southeast Texas," said he had had experience working with firearms as a hunter, but the marshal training took his understanding of active shooter situations to a "new level." Standing in the hallway with arms crossed over his chest, the trainee said his role is to educate first. Being a marshal is merely one way to protect his students, he said. "Our biggest fear is actually having to use our training," he said.